At long last the big tower project is substantially complete. By "substantially" I mean that a few small tasks remain although all the antennas are in use and rotating as they should. This project has taken quite a bit longer than I anticipated or planned for so not everything planned has been accomplished. Even so I am pleased (and relieved) to have achieved this milestone. In an earlier article I described getting to the point of having the tower complete. Now I'll talk about the process to make it operational; that is, with working antennas. One disappointment is that I was unable to light up the top yagis in time for the CQ WW CW contest. As the saying goes: time waits for no man. 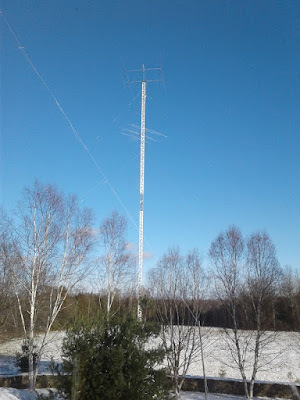 Back in August I was feeling pressured by the approaching winter when major tower and antenna work is out of the question. Even with this foreknowledge I failed to do all that I wanted. My primary constraint was people. A lot of manpower goes into this size of project. You can either hire people or rely on friends. As the ham population ages the ability to solicit help declines, and many who are enthusiastic and willing are not physically able to do so. Hiring professionals is no panacea since everything must be prepared in advance and any mistakes or gaps will result in substantial additional costs. Ultimately I ended up relying on myself and on friends. You can never have too many friends! Cherish them and return the favour of their assistance. With the calendar inexorably advancing I shelved plans for yagi construction and went with what I had on hand. Those yagis and a couple of wire antennas to give me the required coverage for effective contesting and DXing are what I have for this winter season. 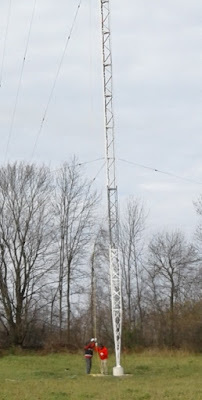 Cushcraft XM240 at 47 meters: I made a few changes to the antenna since it was on the Trylon tower earlier this year. I'll cover this in a separate article. Hy-Gain TH6 at 44 meters: With no time to spare I put this ancient antenna up top for low angle, longer path DX on the high bands. 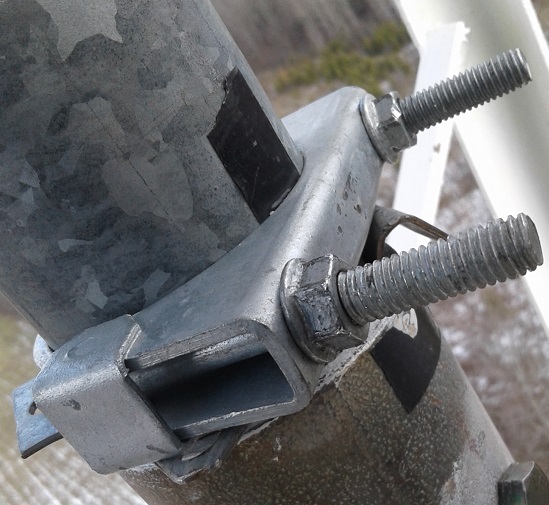 The antenna was refurbished, including trap repair, new trap covers and replacement of the Hy-Gain balun with one from Balun Designs. Hy-Gain Explorer 14 at 34 meters: The antenna is fixed on Europe. It works well enough for a short boom tri-band yagi, though it is not what I had in mind. Next year it will be replaced by a more suitable set of yagis for the important European path. 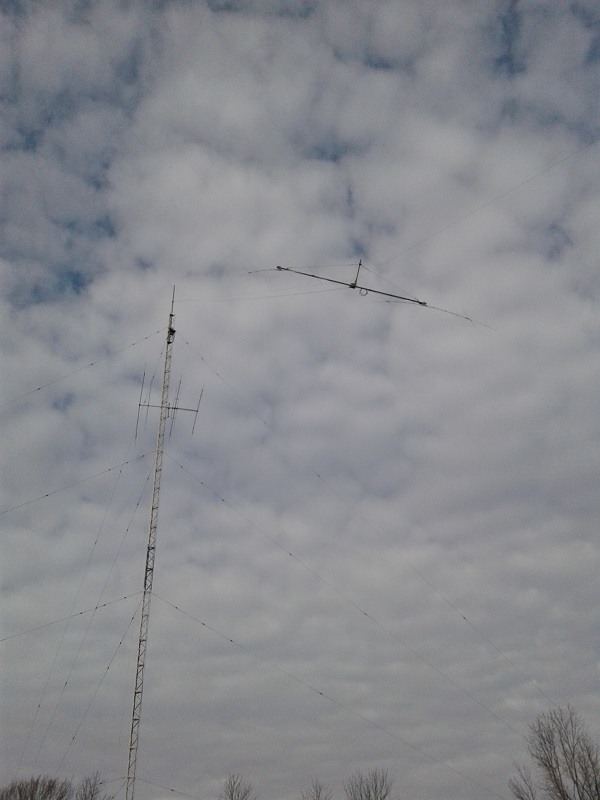 Fan inverted vee for 40 and 80 meters with apex at 32 meters: The 80 meter vertical array is a winter project and there was no time to build a wire or tubing yagi for 40 midway up the tower. This is my solution for the winter, after which I plan to remove it to make room for a more permanent high performance solution for 40 and 80 meters. T-top vertical for 160 meters: The antenna is simple and surprisingly effective with only 8 radials. If I'd known how well it worked I would have planned a more serious effort in the ARRL 160 meter contest. Now I am looking forward more cheerfully to upcoming contests. 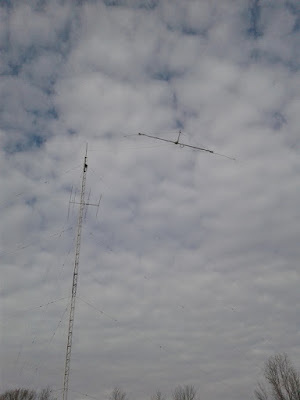 This is a winter antenna that will be taken down in the spring. I don't yet know if I'll put it up again next autumn. XM240 in flight, with integrated boom truss I've been so busy and the bands less than stellar that I have not yet had opportunity to thoroughly test the antennas, especially on bands where I now have two or three choices. There are some expected behaviours and some that were unexpected. This is a subject for a future article. The prop pitch motor is working well so far. I attached the direction indicator potentiometer on my final tower climb and it will be wired up to the shack controller shortly. Raising the TH6 and XM240 with a tram line was similar to how the Explorer 14 was raised. The important differences were the greater weights of the yagis, larger size and top attachment to the mast rather than the tower. These all require changes to the procedure. First, the ground anchor must be moved further out from the tower so that the tram line angle is similar or even lower to maintain or improve, respectively, the mechanical advantage. I had 300' feet of steel cable on the reel and I used it all. I was close enough to a small forest area that I considered using a tree for an anchor rather than my lawn tractor. That would have required a winch to set the tension, which in the time available was an undesirable complication. As it was we were challenged by the autumn dampness which reduced the tractor's traction in the hay field. It needed manual assistance to set the tram line tension. Rigging the antennas for balance and centering required more care due to the greater sizes of the yagis. This was the most time consuming part of the procedure. The XM240 has the added complication of attaching the fragile capacity hats after the antenna is off the ground. Since the yagis were substantially heavier there were two people on the haul rope. The XM240 was lifted low on the mast and raised afterwards to the top. There is a substantial bending moment on the mast which would require a back stay to make the tram line mechanically sound. I chose to keep it simple and not use a back stay. Once the XM240 was on the mast and tested with an antenna analyzer I climbed the mast to install a pulley at the top and thread another rope through it. When my crew returned the following week I tied the haul rope to the mast rope and with their muscle I lifted the yagi to the top of the mast. In comparison lifting the TH6 immediately afterwards was straight forward. As you might expect not everything went according to plan. One of the stainless steel saddle clamps was damaged while fighting the TH6 into horizontal orientation. The threads were greased and (although I know better) I compensated for incorrect position with extra torque on the wrench. The threads galled. A few days later I went up with another clamp and a tap to either replace or repair the u-bolt threads. I was able to save the clamp quite easily by chasing the threads. The TH6 boom truss turnbuckles were threaded a few turns and taped to the boom. A turnbuckle and one of its screws unwound itself and fell off. They somehow survived the 150' fall without any visible damage and with the threads intact. After cleaning the boom truss was completed a few days later. The less on to secure turnbuckles and their screws better for the lift. After the yagis were up for about a week I went up to do some work and got a surprise. One of the shims between the lower and upper masts worked itself loose, moving upward and falling to the bearing plate. I put it back and found that it fit loosely. The next time up the tower I brought along a muffler clamp to hold down the shims so this wouldn't recur. This is a good reminder that the lateral force on the mast due to wind on the yagis is substantial. I was not surprised that the shims would gradually deform under the force to match the mast curvature, but the way that shim got pushed out of the splice was a surprise. Perhaps next year I'll revisit the shims. Coax and wire cables are surprisingly heavy when measuring 130' (40 m). They are not so heavy that lifting is difficult, the concern is that the cable will be damaged when hanging by its own weight. Even LMR400 must be treated with care. LDF5-50A Heliax (⅞") requires special measures. I cleared one of the tower faces of obstacles to clear the way for the lift and ensure the Heliax would not encounter any sharp bends. Due to the position of the side mount brackets and the need to avoid the climbing face this left exactly one choice. Unfortunately that side held the large drive unit for the prop pitch motor at the 140' level. I mounted the pulley immediately below the drive unit. The Heliax would pass through one strut and terminate just below the top of the tower's north side, and there attach to the rotation loops. To accomplish this Heliax was lifted from a point 10' to 12 ' below the top. The rope is taped at intervals above that to protect the cable from interference and damage. The N-connector is covered with a cap designed for this purpose. Andrew sells cable hoists that wrap around the Heliax and distribute the load equally around the circumference over several inches of cable length. I don't have one. Rope can be used to achieve the same requirement with a coil of many turns, wrapping the end so that the rope can't unwind and ensuring that all knots and bends are on the outside of the coil. After each lift I inspected the cable to ensure there was no damage, not even scuff marks or scrapes on the jacket. The cable threads between the Explorer 14 boom and tower. This was accomplished without duress. When the cable approached the pulley I climbed the tower. There I removed the tape wraps one at a time from the top as my helper on the ground lifted the cable in short steps. 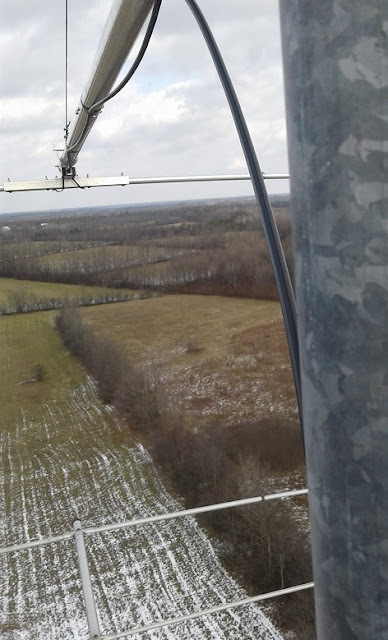 Once in position I spliced it to rotation loops and worked my way down the tower securing the cable at every tower diagonal. If you use the Andrew mounts (expensive) you can get away with intervals up to 5' or 6' depending on wind and ice loading. For major installations such as this I strongly recommend mechanical and electrical tests of every section of feed line once the connectors are attached. At the very least use an antenna analyzer and a dummy load to check that the impedance or return loss is as it ought to be across the widest possible frequency range. Once it's installed and a problem is discovered it is very difficult to isolate and deal with. Don't take shortcuts. I also recommend using the best quality products to protect connectors and splices from the weather. Each run of feed line is in two sections: Heliax from the switch box near the house to the tower; LMR400 or Heliax up the tower to the antenna. I acquired numerous 100'+ lengths of LMR400 as reel ends from a local supplier at a discount for this purpose. Since the side mount antennas (Explorer 14 to Europe and 40/80 inverted vee) are temporary I used the full lengths of LMR400 and coiled up the extra. I preferred this to cutting the cable to length to "future proof" to avoid the risk of waste when it is redeployed. As I type this the cables cross the open hay field above ground. Digging a trench and burying them had to be deferred, on advice of the renter, because the trencher would cause clumping of the half-frozen soil, freeze when exposed and then not settle properly when the soil is pushed back in. I may yet get this done before Christmas once the weather rises above freezing. In the yard I expect to have an aerial run for the cable since burial would encounter too many obstacles. 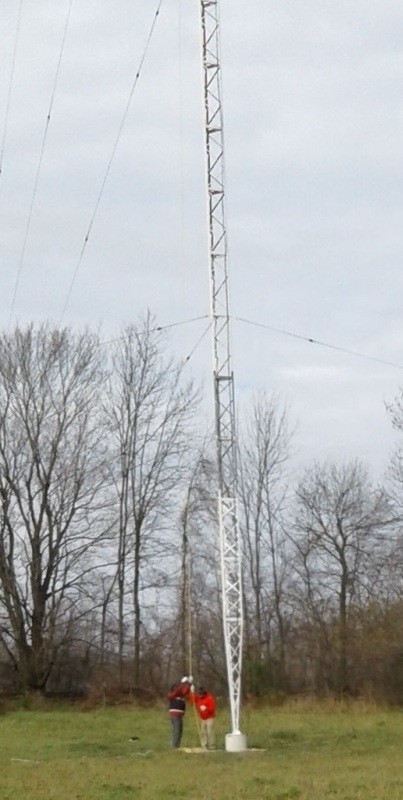 The 2x8 antenna switch is installed at the base of the Trylon (70' tower). 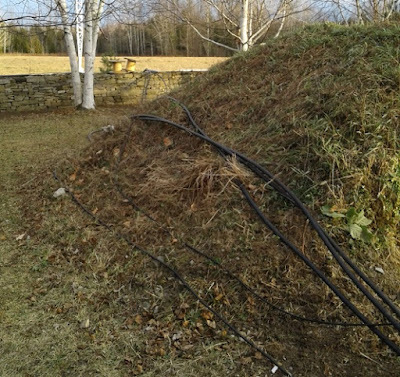 This proved to be a convenient termination point for the many coax runs, including those on the Trylon itself. This unit has all the connectors on the bottom, making it easy to build a weather cover. The tower provides support for the housing and cable terminations. Heliax cables are terminated with jumpers to the switch box to avoid having to contort the Heliax and to make it easy to transition from N to UHF. There are two runs of LMR400 to the shack, plus existing runs for non-contesting antennas. Managing cables this way is much easier than terminating everything indoors and grounds inactive antennas well away from the house. I believe this is a good trade off with having to install and maintain switching boxes outdoors. It will only grow more complex as I add more antennas to my antenna farm. I'll have more to say about switching in a future article. It can get complicated. As I descended the tower the final time after installing the last Heliax run and attaching the direction indicator for the prop pitch motor I stripped off the tower what was left of the rigging. This was little more than a pulley and the 100 meter long haul rope. While I finished attaching the Heliax to the tower my helper coiled the rope and cleaned up the area around the tower. We left everything tidy. All the cables were given one final test, final splices sealed and all tools and material carted off and stored. I even swept the garage clean. With that and some on air testing of the antennas the tower project was declared complete. Of course there will be much more to come next year, but this is nevertheless a major milestone. I am very happy with how far I've come and the obstacles overcome. Winter projects have already begun. 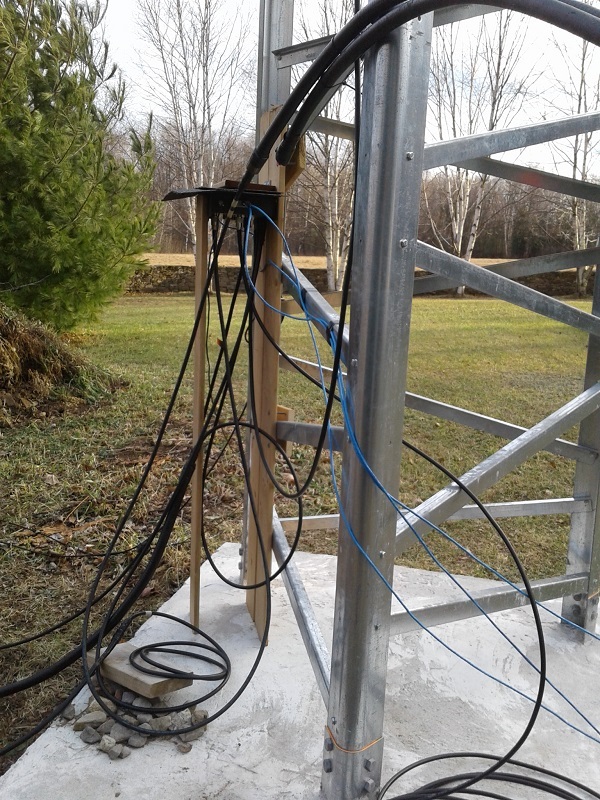 The base is in for the 80 meter vertical array and the new PC is configured for contests. Yet there is much more in my plan. How far I go this winter will depend on the weather and my inclination. Some rest and relaxation is planned, or at least turning to non-ham projects and activities long put off. I committed to give a February talk to local contesters and DXers on the subject of building my new station. That should be fun. Right now the snow if falling and the north wind blowing. This is a good time to switch on the radio to use and enjoy what I've built. That's what this is all about.